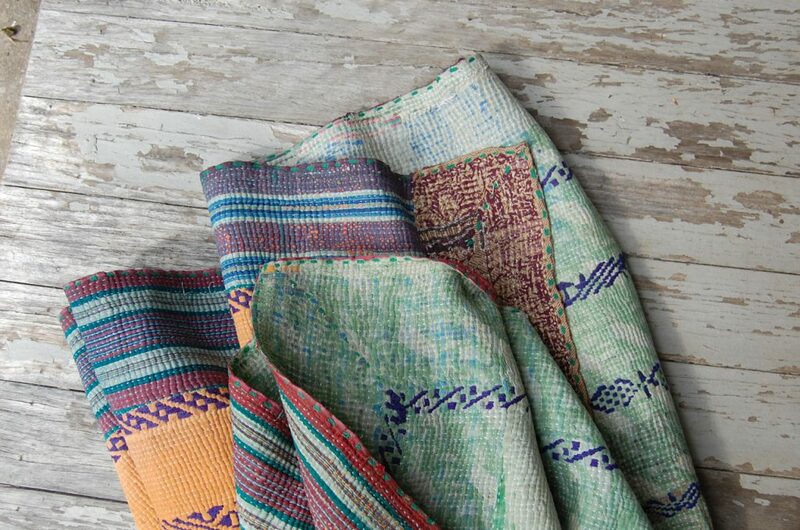 I’m sure you’ve seen the beautiful patterns and intricate stitching of Kantha throws before (if you haven’t, check out our collection of quilts here! ), but what can they be used for? 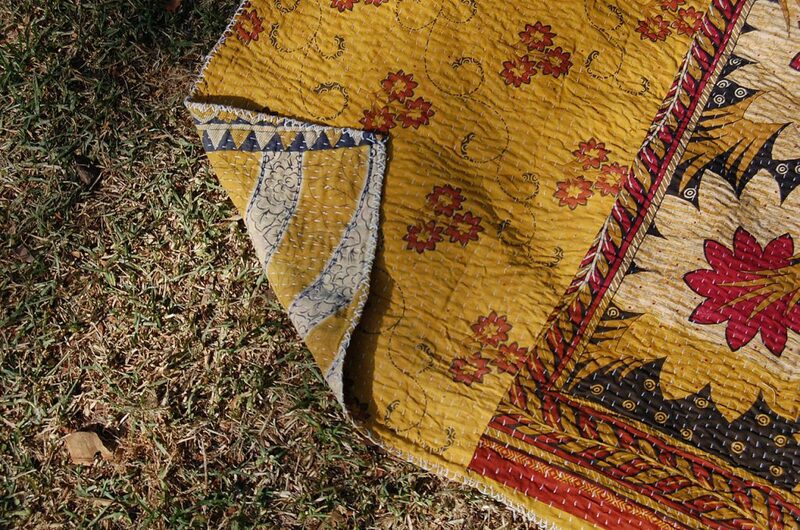 Whether you’d like to embellish an existing colour scheme in a sophisticated living space or create a more relaxed bohemian vibe – here’s five reasons you need to get yourself a Kantha quilt to bring some light, history and fun into your life! 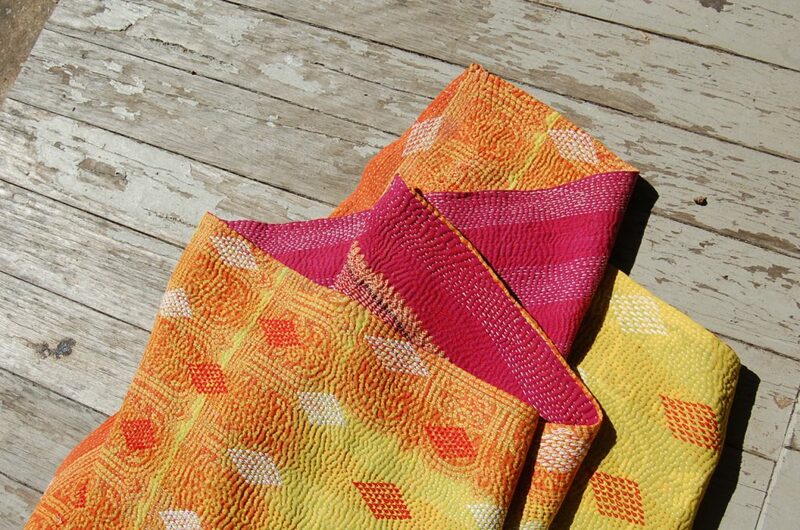 Probably the most common modern use for the Kantha quilt – they’re great all year ’round. Wonderful layered, for that true ‘boho’ look, they can provide instant warmth on those chilly nights, but they can also be light enough to use in warmer months if they have more delicate cotton layers. Got a dark little corner that you can never seem to brighten up? We have the perfect fix. 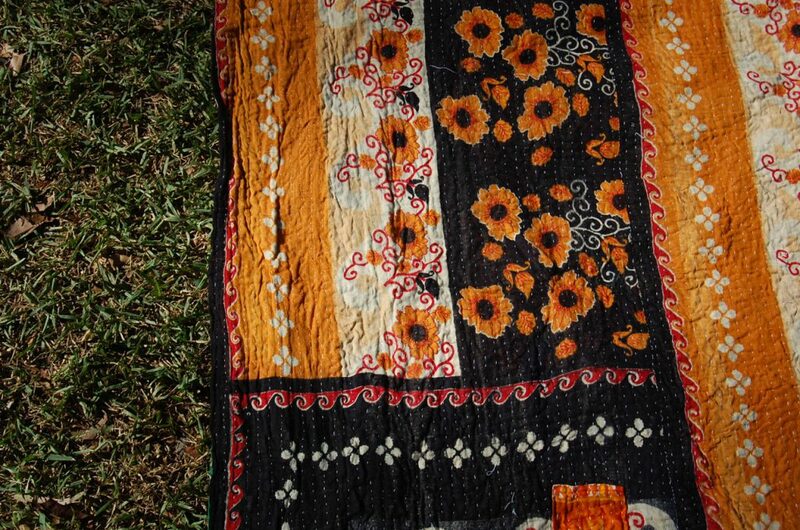 Lay a kantha quilt over a cabinet, or on a lonely couch to shed some much needed brightness. Vice versa, a chaotic and overly bright space can be cooled with an indigo quilt and calmed down with a Kantha featuring a much calmer and delicate print. Another favourite in our home is a couch throw – whether it’s literally thrown onto the couch to give a much needed splash of colour or pattern, neatly folded or hung on the back of the sofa or armrest, the Kantha throw can be used to liven up a couch or as a blanket for snuggling up under (with popcorn of course)! Alternatively, a fun weekend break from night re-runs of Friends or Breaking Bad could have you set up some floor cushions and layer them with kantha quilts for a romantic setting. Perfect for that cheeky glass of wine and Indian curry you’ve been dreaming about all week. Kanthas make great wall hangings and can be an incredible talking piece for a lounge feature – or even an office space. The best thing about it is the 2-in-1 feature of the kantha – as they are double-sided they can be flipped creating a dynamic wall space! Our favourite use at O&M HQ is the picnic blanket. Kanthas are the ultimate picnic blanket – versatile, colourful and even reversible – so you really get a choice of 2 designs each time! Light enough to carry or stash in your bike basket, you’ll be the envy of all the other plain plaid blanket owners in your local park. You can keep a small kantha rolled up in your glove compartment for the impromptu country picnic getaway at any time, you can even have an indoor picnic in the middle of your lounge. 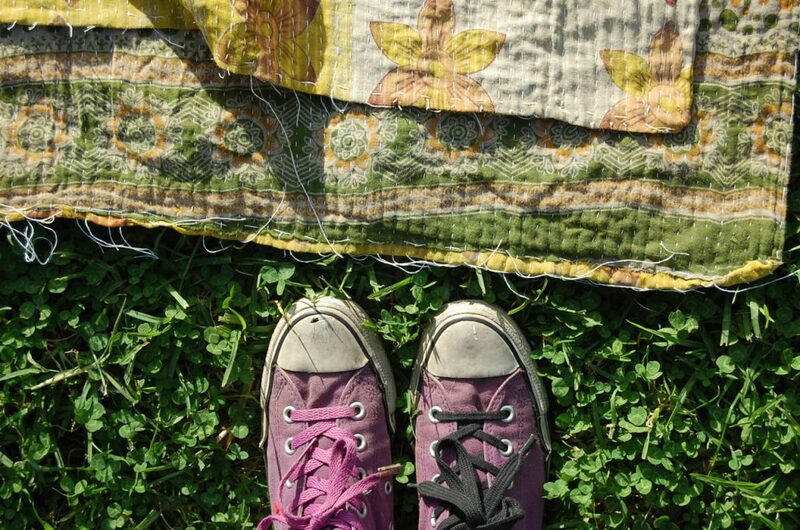 How do you use your Kantha quilts? Comment, give feedback or ask questions below! 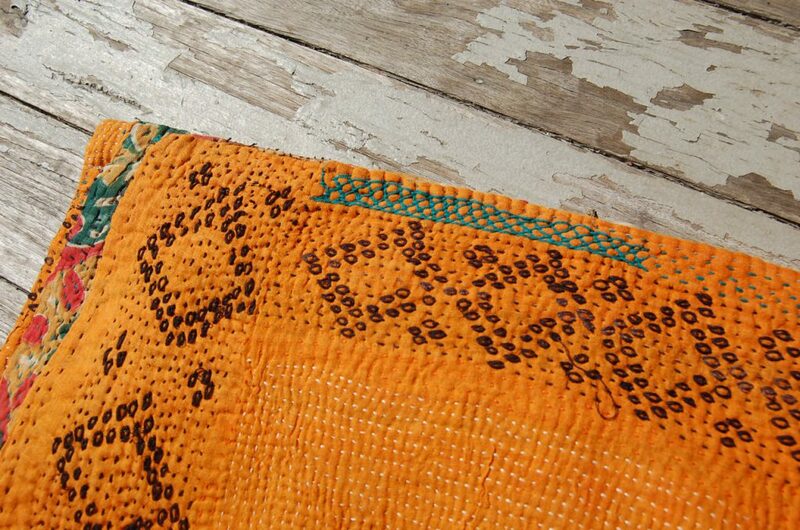 Made from recycled sarees, “Kantha” reportedly translates roughly to ‘rags’, likely referring to the reclaimed nature of the vintage fabrics and repurposing methods in which Kantha quilts are created. 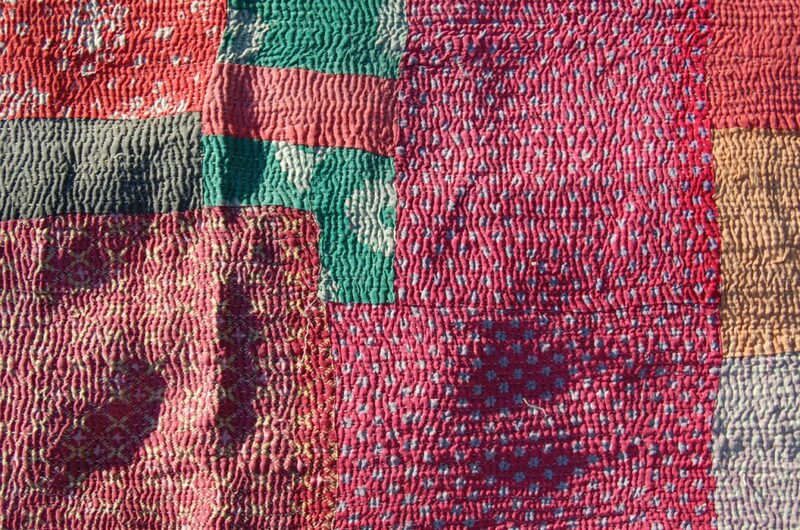 Far more beautiful than the original name inspires, Kantha quilts are a vibrant patchwork of layers upon layers of patterned fabrics, bold colours and of course a rich history which is woven together with each stitch, patch and stretch of beautiful fabric. Often dyed with natural colours using leaves, grains, seeds and roots such as turmeric, the quintessentially Indian look of the blankets makes for a bold statement and brightens up, cools down or adds life to any living space or armchair you can drape them over. 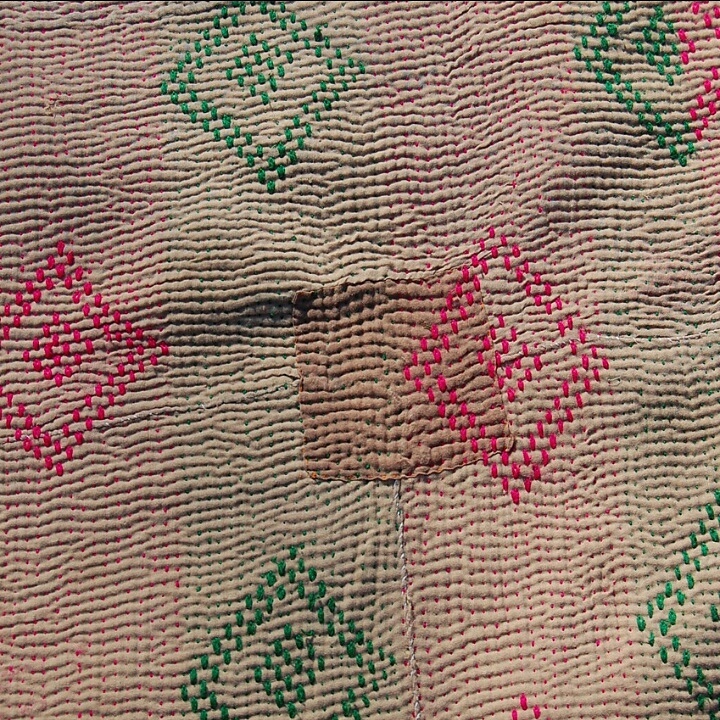 Kantha stitch is one of the oldest forms of embroidery that can be traced back to ancient India, the name also having a double meaning as ‘throat’ with roots in the story of the Hindu deity Shiva and how his neck was turned blue in an effort to save humanity from a poisoned ocean, earning the nickname “Nila Kantha” – meaning blue throat. 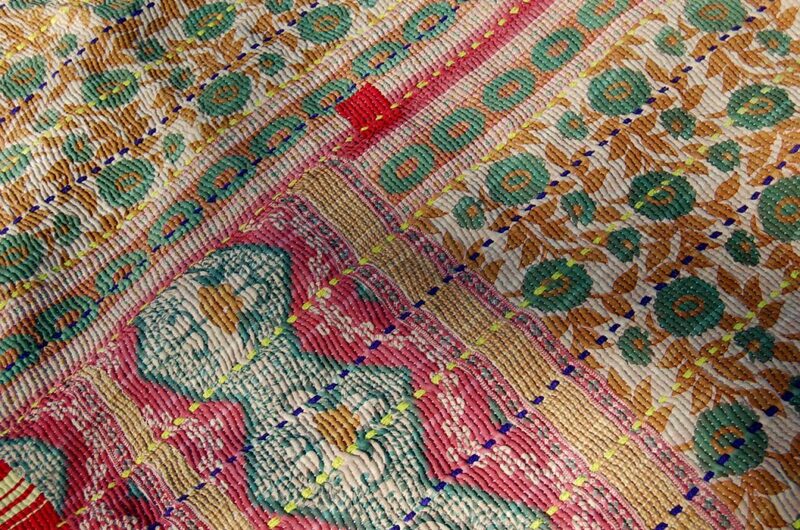 Ancient Kantha quilts often had ceremonial symbols and animals printed and stitched in their patterns, and were used in births and wedding ceremonies. 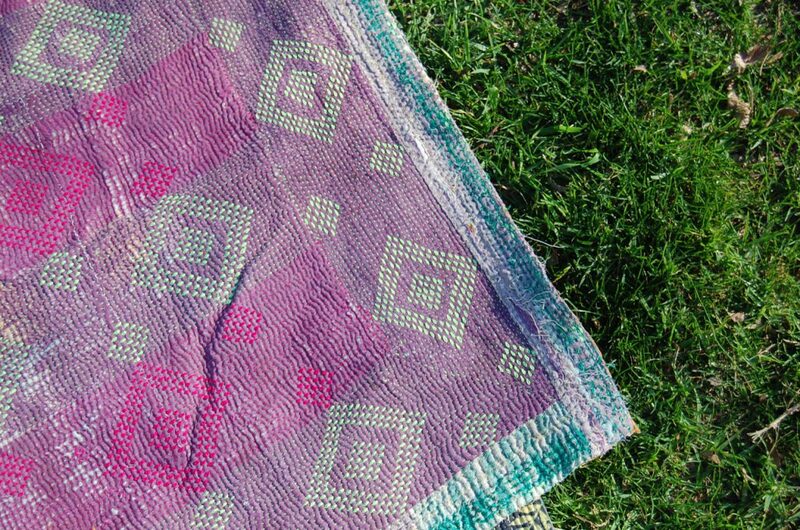 Women of West Bengal would stitch Kantha quilts, handkerchiefs and other personal articles with handmade motifs relevant to the family member or gift receiver; the art of which was passed down from mother to daughter. 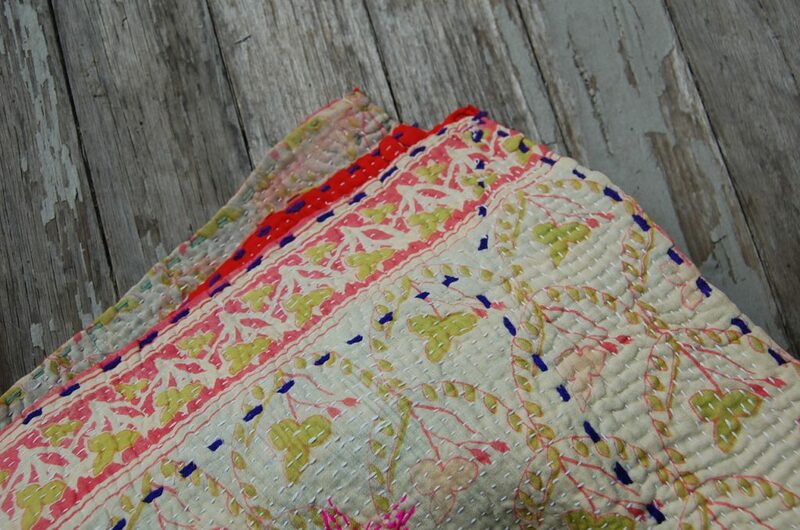 Now the Kantha stitch is still used traditionally in India and kantha quilts have gained a worldwide appreciation for their wonderfully eclectic and unique style of mixed fabric prints and patches combined with all-over hand-stitching. 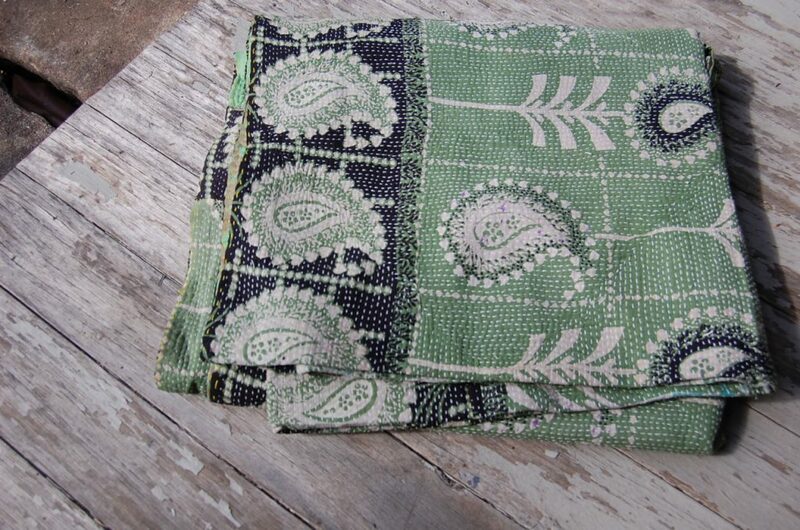 Kantha stitching is also not limited to quilts – it has crept into Western homes in the form of cushion covers, duvet covers and smaller items like bags, purses and even jackets. Kanthas are a symbol of history, culture, family, strength & ingenuity. 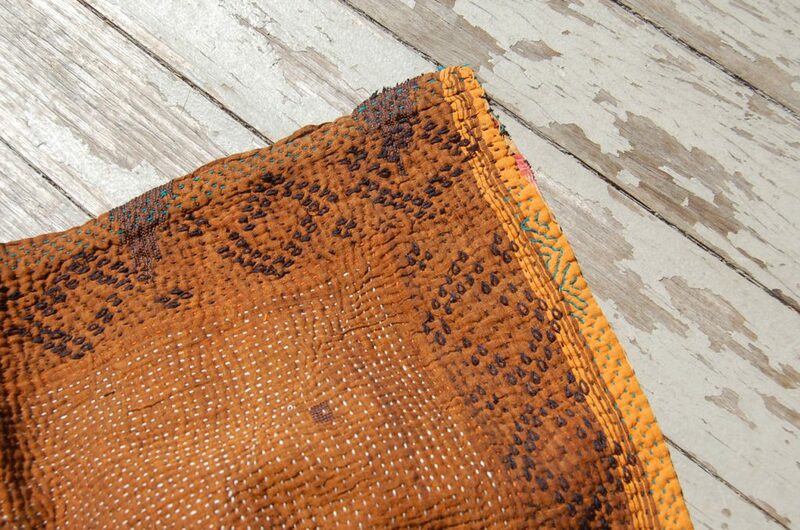 You can also see more of our favourite vintage Kantha throws over at our Etsy store. 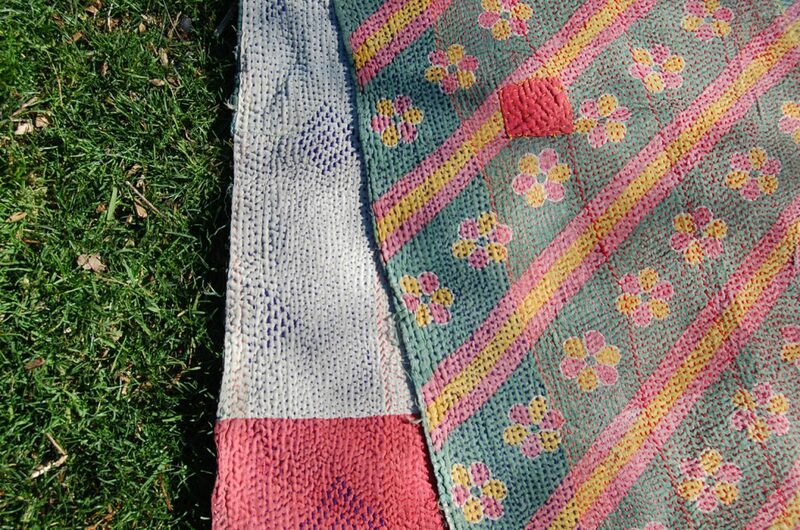 We’d love to hear how you use your Kantha throws below! Long referred to as “Indian yellow” or “the golden spice”, and with a rich history as an Indian flavored culinary spice, Turmeric also boasts many other uses from a natural fabric dye to medicinal super food in various cultures – along with a delicious flavor and earthy scent, Turmeric has long been though to boost the immune system and fight cancer in both Indian and Chinese traditional medicine due to it’s anti-inflammatory and antioxidant properties. The vibrant yellow colour of turmeric can been seen in traditional Indian saris and fabrics, with beautiful gold hues striking a start contrast against the deep red, blues and greens that make up traditional patterns and fabric designs. 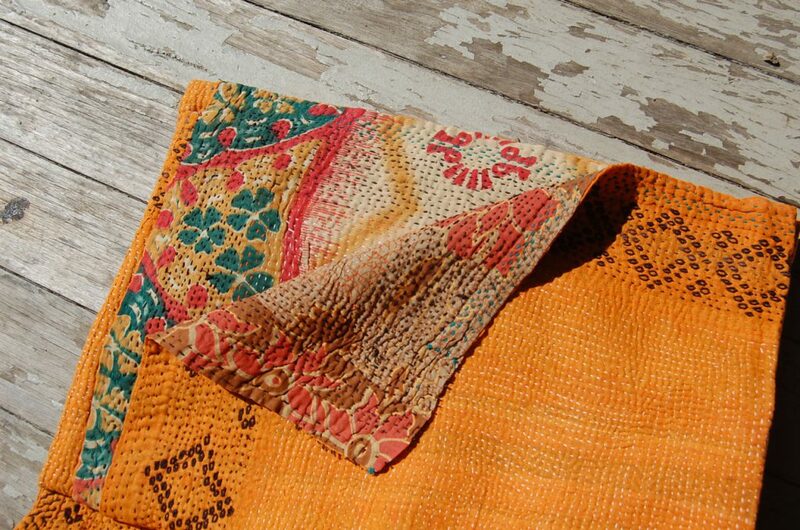 Vintage saris dyed with turmeric shades are featured extensively in Indian quilt patterns, Kantha blankets/Kantha quilts and modern home touches like Kantha cushion covers. 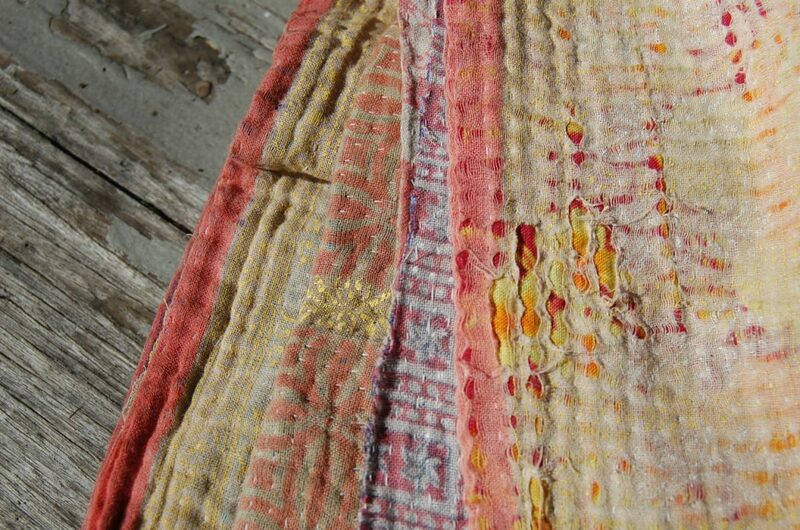 A bright “Indian yellow” Kantha duvet dyed with natural turmeric dye lightens and brightens a home with a rustic touch, and can be used as a throw, picnic blanket, stylish poncho or even a Kantha tapestry wall hanging. Intricately hand stitched in recycled indian sari quilts and reclaimed fabrics, Kantha quilts have long been great way to save vintage saris that were out of use or style, in modern times the Kantha quilt is now a bohemian statement and homely addition to any home, with fantastic collections available here at The Kantha Project and on Etsy. Natural plant indigo, turmeric yellow, pomegranite rind for pinks, seeds and various other roots and leaves have long been used traditionally in Indian fabric dye and can be seen in many recycled handmade Kantha quilts. 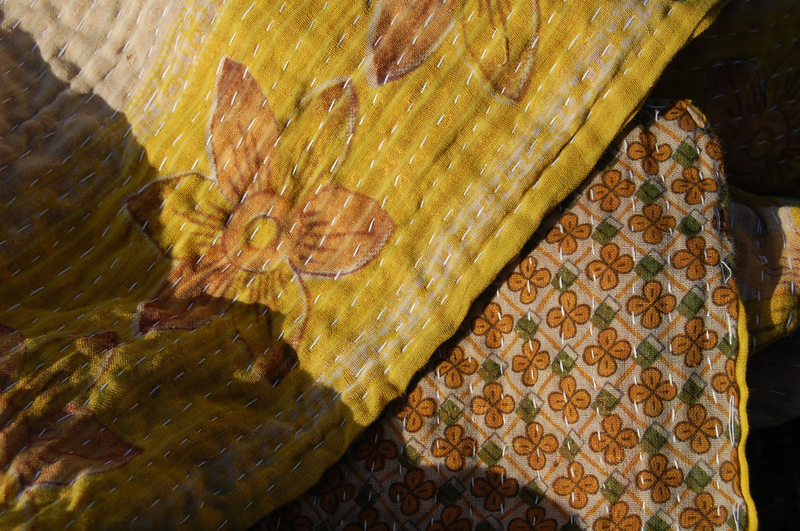 We’d love to hear how you use your Kantha quilts and if you have any that are dyed in the beautiful shade of turmeric “Indian Yellow”! 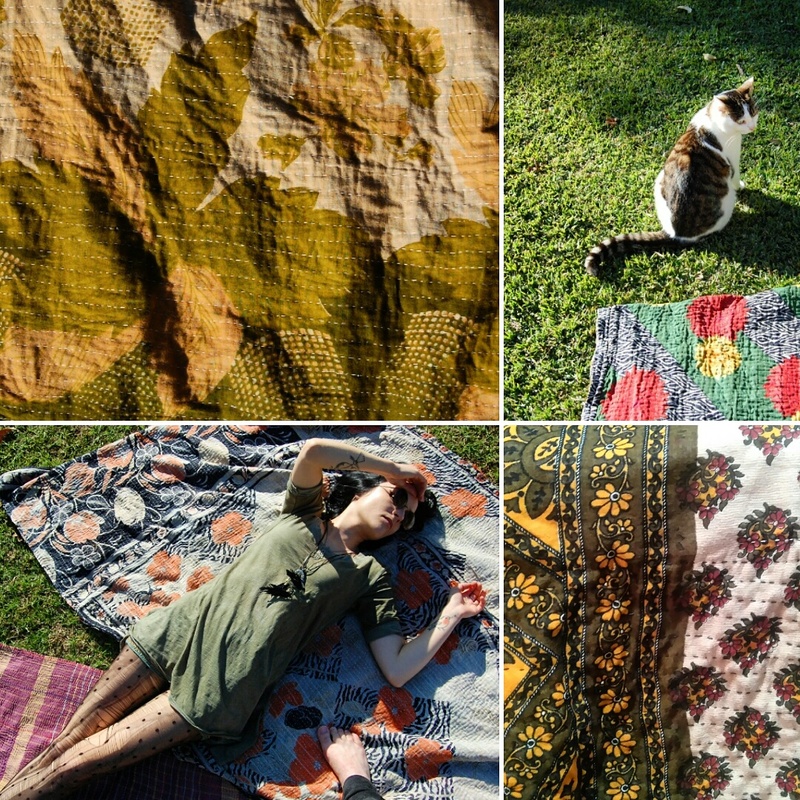 If you’d like to see more quilts that feature “Indian gold”, recycled cotton saris and other naturally dyed fabrics, see more on our Etsy store. Feel free to leave some feedback or any questions below! I am breath-taken. Each new delivery brings a wonderful diversity of colour and pattern – sometimes in just one quilt! Carefully unwrapping the package like a child at Christmas! I am more and more infatuated with the intricate detail, the textures created by the astonishingly elaborate needlework and the fabrics! 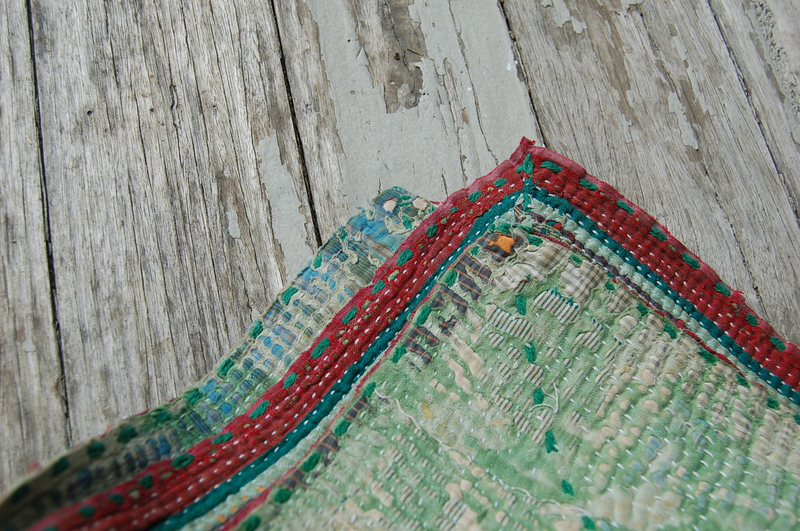 This is The Kantha Project. A love of colour, pattern, texture brought me here. Immaculate, rich & vibrant meets the demure, soft and understated. All at once. It’s a dream. 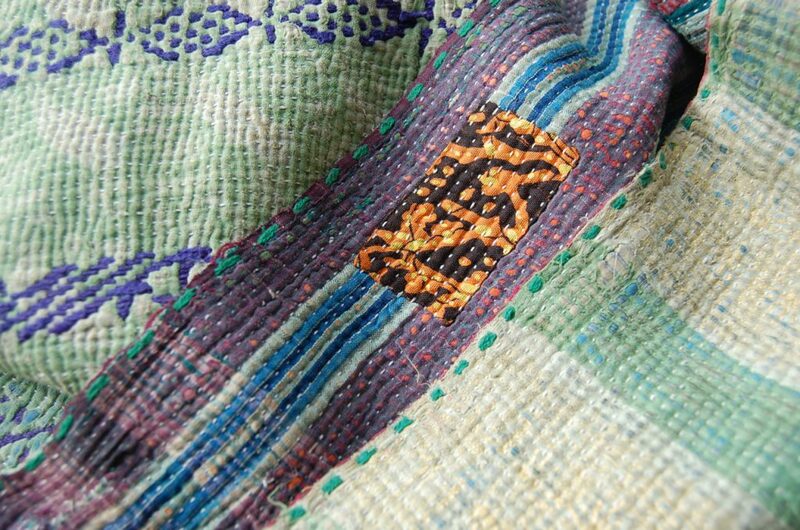 A wonderful colourful, textural experience ~ of the age-old stitching technique known as “kantha” native to the artisans of India. It’s a textile wonderland. Featured here are INDI, NAWAL, MAGIK, BINDI & MOON. 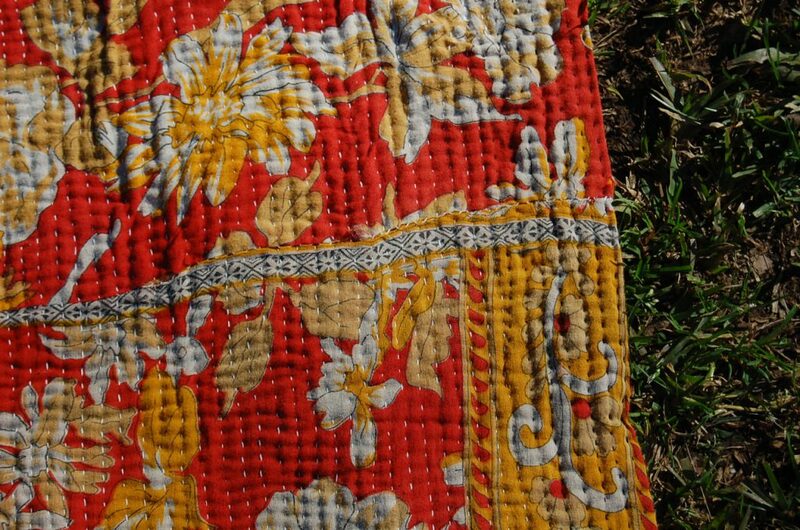 The Kantha Project brings you vintage kantha quilts from India, individually selected for their uniqueness & beautiful textile qualities. We celebrate the beauty of items that are created by hand; the craftsmanship and energy that goes into every stitch, taking time and patience and ultimately creating something extraordinary! Selected, presented, prepared & wrapped with love in Australia. 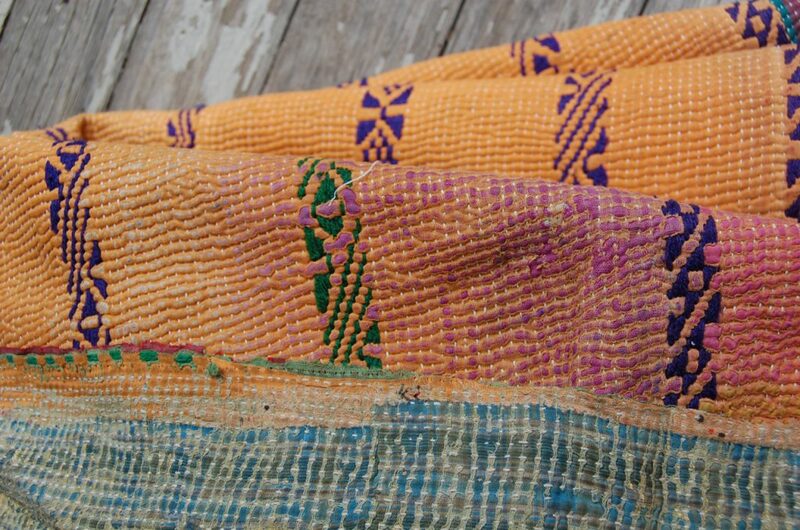 Here, I’ll share with you the details of each piece and inspire you with all the kantha-related goodies ~ welcome to my passion in photographs. Life is but an adventure ~ seek the wonderful.